That may be true if you are a Jedi Knight, but for the rest of us, me specifically, not so much. In February, I jumped feet first into uncharted territory after attending a board of education meeting. Our school district is in financial crisis. Many cuts are on the table. I went home that night heartsick about our district and the financial trouble it is in. Some people blame the administration. Some people blame the school board. Some people blame the teachers (who at that time had been working without a contract for approximately two years). Some people blame the Michigan legislators. I began to think. What if? What if people stopped complaining? What if people stopped placing blame and pointing fingers? What if people came together to make a difference in the lives of kids? What if we raised money to pay for one of the positions being cut? I emailed the superintendent of the district first thing the next morning. He called me within 10 minutes. For details and background on the position I was fighting to save, read this. I proposed starting a fundraising campaign separate from the district to raise the funds. Was it legal? Was it something he’d be willing to let me try? The position being cut impacts every student, teacher and staff member in the district. Once I had the blessing of the superintendent, I contacted an acquaintance who I knew to be very passionate about this position and a very involved parent in the district to see what she thought. The next four weeks were a whirl wind. We met with the superintendent, the township supervisor, the local community foundation. We received so much guidance and support from these people! It was truly remarkable. On March 1, we attended the school board meeting and announced the launch of BSP CARES: Bedford Students Protected through Combining Area Resources for Educational Safety. We worked our tails off and had much early success, raising $17,000 by the end of March. The media was very kind to us and covered every fundraiser we had, helping us spread the word. We definitely had the support of the local business community. But over time it became clear that we lacked the financial support of parents and teachers-the two most important groups if this effort was going to succeed. In the end, we raised over $38,000 against a goal of $80,000 and the position was cut December 6. I learned a lot about people in our community, politics, my family and mostly myself. Our community is filled with generous people! Generous with their time, their talent, their wisdom and their money. People can take the well-meaning efforts of two moms and turn them into a political issue. I jump in quicker than I should sometimes. I allow my priorities to get upended sometimes, putting other things ahead of my family. I’m not bad on camera. I place a lot of importance on my hair. So, no, I’m not a Jedi Knight. I’m a mom. A wife. A community member. And so much more! And, I’ll keep on trying! Talk to me! Have you ever taken on a huge project that you were very passionate about only to fall short of your original goal? How did it feel? This entry was posted in This and That and tagged BSP CARES, community, family time, fundraising, life lessons, Motivation, Parenting, school safety, volunteering, Yoda on December 6, 2012 by Amy. I’m 42 years old. I’m ridiculously, pathetically, and embarrassingly out of shape. Not surprisingly, I’m also overweight. Not ridiculously, pathetically or embarrassingly overweight, but definitely overweight. I don’t enjoy exercise, I don’t enjoy sports. Never have, never will. I’ve made attempts over the years to get in shape and to lose weight. Can’t say I’ve ever gotten in shape, but I have lost weight. Trouble is, every time I lost it, I got pregnant again. Other than the pregnancies, I think the main thing holding me back was lack of motivation. I need a buddy to encourage me to get to the gym, someone to cheer me on–and someone for me to cheer on–to victory. I’ve never really had that before. Now, I do. This is it. This time is different. This time will work. The ‘baby’ is 2 1/2 years old. Time for the baby weight to go away. It’s time to take control of my body, my mind, and my mouth. Time to shape up! I took the first steps today, literally. Two of my friends and I hit the gym at the local YMCA. We put the kids in the childcare center and off we went. I spent 35 minutes on the treadmill. Didn’t love it. But didn’t hate it either. And so it begins–again. And for the last time. We’re going back tomorrow. We can do this. Together. We. Can. Do. This. 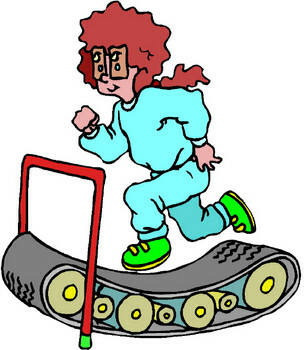 This entry was posted in This and That and tagged baby weight, exercise, Motivation, overweight, treadmill, weight-loss on March 9, 2010 by Amy. Of all the things I’m thankful for, one of the most important is my faith. Like most people, I’ve had my share of trouble’s in this life. The past year and a half have been rough. My faith in God and trust in his plan is what gets me through this and other difficult times. Now, I’m not going to pretend that I never have a down day, that I never get scared or worried. Of course I do! I’m human. But, ultimately, my faith gives me hope. I shudder to think where I would be without it. During a time in my life when things have been difficult, I’m also thankful for the example of faith, patience and perseverance that has been set not only for me, but for the world, by Anissa and Peter Mayhew. I don’t know these people, but I love them and I pray for them continually. I first heard of Anissa on November 17 when a couple of her friends and my twittermates (@laughmom and @dbinkowski) tweeted expressing their concern for her. I’m not going to attempt to tell her story here–the short version is she’s a 30-something wife and mother of three who had a massive stroke. Her story is already being told very eloquently by her husband, Peter at Hope4Peyton.org. It’s through his telling of their story that I have found a renewed faith. This family has faced so much heartache. My problems pale in comparison. Yours probably do, too. we must be patient as God works out his plan is evident. I don’t presume to know God’s plan for myself, much less the Mayhew family. But, I can tell you this: people have been introduced to God and shown his power through Anissa and Peter Mayhew. And, other people, like me, who already knew God, have been inspired to trust Him more and to wait patiently for His will to be done. There was BIG news, HUGE news from Peter today. Anissa is going home today! After 92 days, Anissa is going home! I encourage you to read more about this incredible family. If you’re not moved to tears at least once, well, then…? This entry was posted in Thankful Thursdays and tagged Anissa Mayhew, faith, God, Motivation, stroke, Twitter on February 18, 2010 by Amy.